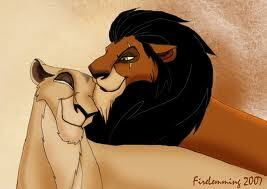 Scar & Zira. . Wallpaper and background images in the Scar club tagged: scar zira the lion king disney. This Scar fan art might contain 肖像, 爆头, 特写镜头, 特写, 爆头特写, 皮肤, 肤色, 裸色, 偏下体, 暗示裸体, skintone, 部分裸体, 隐含的裸露, 部分下体, 隐含的裸体, 动漫, 漫画书, 漫画, 卡通, and 漫画卡通.